2017 will be the Year of the Terrace. Terraced homes, built in rows: neighbours on either side, but not or above or below. They’re relatively cheap to build, and they’re within the reach of many small/ medium-sized building firms, ones which have traditionally concentrated on detached houses. Of course, Auckland is building many kinds of housing – from detached McMansions right through to compact apartments. But terraces are a nice middle ground for many people, and this year they’ll be built in all corners of Auckland, and in many of the more central parts as well. Which corners? For starters, Orewa, Silverdale, Whangaparaoa, Long Bay, Albany, Hobsonville, Massey, Sunnyvale, New Lynn, Mt Wellington, Flat Bush, Mangere Bridge, Takanini, and Papakura. As a rough guide, terraces will get built anywhere in the city where they’re allowed, and where the land values aren’t too high. In high land value areas, people will probably hold off and try to build apartments instead. This may be a bit of a waiting game depending on the area. The high value areas include the central suburbs, much of the North Shore, etc. Many of these suburbs have already had their share of ‘intensification’, with sausage flats and back sections subdivided over the last 50 years or so. In these areas, it’s only apartments which will give a big enough leap in value for them to get further intensified. Many of those apartments will be low-rise, maybe 2-3 storeys. They’re not much more complicated than terraces, so a lot of builders could start to look at them as well – and the Unitary Plan gives more flexibility around where they can be built. 2018 could be their year, but terraces have had a head start. The RCG Development Tracker shows hundreds of apartment and terrace projects across Auckland. Big ones and small ones, private and public, and many Special Housing Areas. Enough to house many thousands of Aucklanders, if we could just get them all built. In Auckland, we’re now at near-record levels for terrace consents. Over 2,000 homes per year being approved, with a strong upward trend. Contrast that to apartments – which hit 2,000 a year but have eased back – and retirement village units, which have also eased back. All of these “attached” dwellings combined add up to 4,443 homes approved in the last year, still less than the 5,694 detached houses approved. 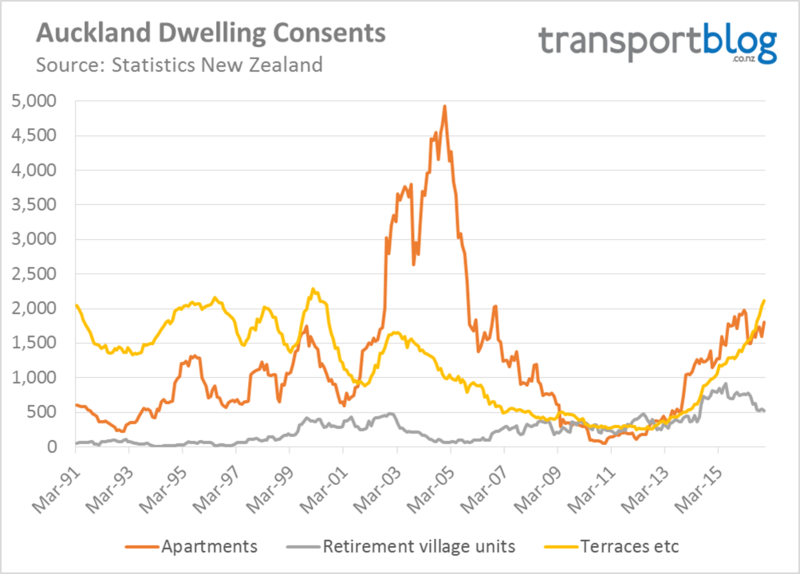 I’ve previously claimed that 2017 will be the first time Auckland approves more “attached” homes than detached ones – that prediction will succeed or fail based on how terraces do this year. The average house now costs almost $450,000 to build (just the construction cost, not any of the other costs. Tell that to the next person who mentions Demographia). 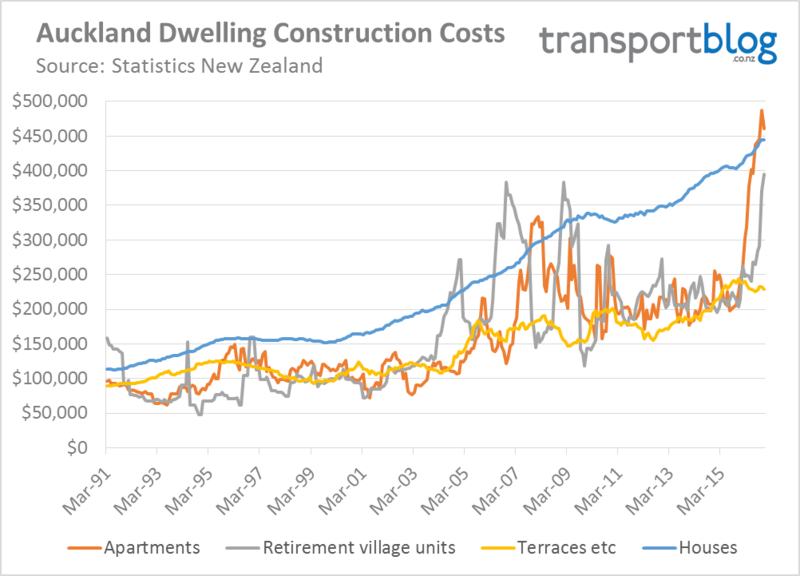 Most of the homes we build in NZ are detached houses: over the last 25 years costs have tended to increase smoothly, although there’s a sharper trend at the moment with builders under pressure. There aren’t that many apartments built, so the line is a lot jerkier based on individual developments having an influence. Very few were consented from at least 2008-2013, so don’t pay too much attention to that part of the graph. The real kicker, though, is the huge cost increase in the last year or so: the average apartment now costs more to build than the average new house! I put this down to the small number of builders who can handle apartment construction – mainly big commercial firms, most of who are very busy, not just with apartments but with offices, the Christchurch rebuild and all the rest. If any Australian builders are reading this, they’ll be looking at the graph and wondering how soon they can set up an office in Auckland. Hopefully some are, we desperately need the competition. Apartments should be much cheaper to build than they are at the moment. Retirement villages are in the same boat, and up to almost $400,000 per unit. Of course, most of these units are apartments – Auckland’s retirement villages have started to build upwards in a big way. Terraces have had a much smoother cost curve, like houses. They’ve avoided the huge cost inflation of apartments in the last year, and the average terrace now costs about $230,000 to build. There’s a lot of other costs that go into new homes besides just the construction – but at the moment, terraces have a big cost advantage. Add that to the fact they use a lot less land, and you can see why developers all over Auckland are trying to get into terraces. Places like Flat Bush have many 2 story houses built close together. Or rows of terrace houses a little better than what I saw on Coronation St many years ago. Many have restricted views.The garage is often where the views are best from. There is little garden and paths, decking and concrete cover most of the property. Apartments especially near a PT stop are a better choice for many. You’re right Jim, so once you design out the garage you end up with a reduced (cheaper) dwelling size and quite a nice living space at ground level. One of the most retarded ways to build townhouses I’ve seen so far is in Stonefields, with most of the lot covered with a house in the front and a garage in the back. And also, the waste of space by having a roadway both in the front and the back. It’s always those cars. A way of dealing with them without covering up your entire lot, it is to put the garage on the ground floor, and the living space on the first and second floor. But that assumes you are allowed to build at least 3 storeys. The advantage of those townhouses over apartments is that to build one, you don’t need the upfront capital to build multiple houses at once. Regarding views, I don’t think the typical stand-alone house is much better, especially the recent ones. A road at the front and a service lane at the rear was common in many countries – for example Coro St terraces, Vancouver, inner parts of Melbourne iirc. I know. But I still wonder. You can access your property in the back. You put the garbage out in the back. So what’s the street in front for? The point of those service lanes in Melbourne was actually to be the sewerage system. Before plumbing people had a outhouse toilet facing the lane, and at night a man with a cart would come along and remove the solids for use as fertiliser. Service lanes in inner Melbourne and Sydney? Don’t forget they make great cricket pitches and (fast) bowling creases 🙂 Point being they are not wasted space, they are communal space. Next time I’m over that way, I should take a look around Stonefields and see if they are attempting something similar. Yeah, as you say it’s always what to do with those cars. MHU and ATH zones are typically in areas earmarked for improved public transport and nearby amenities, so theoretically it should be possible to leave out the cars altogether in some neighbourhoods. Then it comes down to a choice between apartments for people who don’t want a ‘bit of earth’ and terrace houses for people who do. Can you imagine the number of individual driveways if the service lanes were not present? They’re great and I reckon Stonefields has some of the best medium density/terrace housing available in Auckland. I am surprised there aren’t more terraces already. A lot of houses have been built so close together that you have a useless little side yard that does nothing for your amenity. Terraces have the advantage that you don’t get overlooked as everyone has a view only to the front or back and living areas are downstairs. So you can’t see into each others windows and the only view of the neighbours backyard is from a bedroom, which isn’t used much during the day. They can be built for less than apartments (per sqm) so you can build big, middlesized and small. We have misguided regulation to thank for that, until now those useless side lanes have been required. The Mixed Housing Urban zoned land seems to be in highest demand at the moment especially in the South. I just wonder if we have enough of that kind of zoned land available? Probably not, but I’ve always thought the UP was the start point of clearing out all the myriad of silly rules into some broad categories. The next go out the UP will probably have a lot more up zoning as rapid transit starts change the way people think about the urban landscape. re: apartments prices – A lot of consents in the last year or two have been fairly high end so that’s surely pulling that average up. Most medium range ones seemed to fall over or never begin. Speaking of Australians, Grace is the first entry for Little Projects from Melbourne – the market is flat-lining over there so they are unlikely to be the last to give Auckland a go. It doesn’t make a huge difference to the consentable construction cost whether the apartments are low-end or high-end – it’s mainly the interiors, finishes, etc which make the difference. Plus the location, of course, and that high land cost is part of the reason why you pay premium prices in premium areas. I think the core structure of the building is reflected in the price. Big blank walls, weird columns etc are all signs of cheaper buildings. The high end ones design for space first, which increases construction costs. As you say, location is a big cost also – I’m not aware of any ‘luxury’ apartmenrts getting built in Albany – all in a circle around the CBD. Not sure I see construction companies coming over – the limitation seems to be the people to do the work and access to materials, not the overarching structure/management of them. John surely that’s not the case; higher end apartments will cost a great deal more per square metre both in terms of spec but also with things like underground parking won’t it? Land cost is a part of it, but only a small part. For example, a six level apartment complex is being built on Anzac St, Takapuna. Lets say the land cost was $8M for simplicity (it was less than that). Therefore for the 92 apartments that is $87,000 per apartment. A couple of years ago that land cost would only have been $40k per apartment. But both of these figures are far removed from the starting price of about $530k for 40 sq m.
This is at the huge success of apartment building; they are the best and quickest way to add supply to distorted ad failing markets. Just out of curiosity, how does that compare to the CPI? And aren’t those rising costs for detached dwellings simply an artefact of their ever increasing size? And terraces are usually smaller. So maybe 2017 will be the Year of the Small House. I guess that depends on if they’re at all legal, and how heavily building smaller dwellings is penalized by the zoning rules. A point to consider, building costs have little relevance to sale price – developers want top dollar (understandably) and offer dwellings at prices that suit the local the market. it’s shocking to see how few apartments are being consented in Auckland, given how out of whack prices are at the moment. What could be the cause? Over-zealous regulation of apartments perhaps? Just a thought. Maybe its buyer resistance with current sales price’s at around $12,000 (yes not 1200) per sq m.
Anecdotally, this is set to change with the UP and is already changing. I think there were quite a few developers awaiting UP change so they could skip RC process. The new Auckland Unitary plan which I have studied for about a week is really quite exciting as far as unitary plan changes could be. There are some hidden nuggets in there which take a lot of reading and I think it;s best they remain hidden until the retard evil Auckland 2040 / 1740 coalition gets there case kicked out of court. Buts its quite funny what the council have managed to get through really. We can be very optimistic about the changes this plan has made. Classic example its the retirement village in Devonport. Of all places in Auckland its pretty amazing this passed with no changes to the plan in Devonport. So this is the example of how things can happen fast now. Also on that I think Materials will now be an issue for many developers. I hope we get some heavy industy in Concrete products, glass etc for the raw products… Else Material price will hold the industry back.!! I own and live in a terraced home. I think it’s brilliant. I was on the bus down Mt Eden Road a few months back and observed old & unloved freestanding homes dotted on the street. If only the unitary plan had the guts to designate the land on Mt Eden Road as terraced housing. What a wasted opportunity with “wasted” land – modern terraced housing would be perfect. Close to town on a frequent bus route. If NZ wants to be “mature” and have apartments and townhouses and terraces like “big boy” cities then it needs to copy the “big boy” cities and allow pets in owned dwellings by right and in rentals as the usual. We have laws already preventing the harms caused by animals (e.g. noise laws, rental bonds), so why do we refuse to allow pets? If I buy an apartment and have a dog, and that dog barks, then use the laws against excessive noise. We don’t ban stereos. I own my own house and see so many disgusting examples of people who don’t have that luck abandoning pets due to their inability to find a place that takes them. I’m not a pet owner, but I do live in an apartment, and I agree absolutely. There are mechanisms for addressing any problems that might arise. There is no law against pets in apartments or townhouses. In apartments the body corporate (i.e the owners) decide whether to allow pets or not. My body corp had this discussion not long ago and revised our pet policy to suit the owners desires. The problem with trying to ban particular dogs from particular apartments post-facto is that you’ll never be able to do it in practice. For something that can be consistent and practically enforced you either allow them or you don’t. We certainly do have bans on certain things, for example using power tools is banned without prior approval. In townhouses there is often no body corp at all, they are individual houses where the owners can set whatever rules they like. If you have a problem it is with your landlord. I note that most rentals, including stand alone houses, have a pet ban as standard. I adopted a beautiful 7 year old yellow lab from a family that couldn’t find a rental property that would accept him. Madness really, talk to anyone with a rental property and they’ll tell you that children do far more damage than pets. I’m not suggesting we ban children or pets, I think both are ace. Yet from my experience of recently hunting for a rental with our small child in tow, they seem to be falling over backwards to get us in. Do landlords generally not have dogs themselves, or are there lots of dog owning landlords that still ban them on their properties? The way things are now landlords don’t have to chase anyone. Last time I listed my apartment I had fifteen groups of people call within 30 minutes, most demanded to view that evening. Putting “no pets” as a condition isn’t going make an iota of difference for how easily you can lease it or the money you can get. A stereo doesn’t turn itself on and make loud noises when the owner goes out. It doesn’t start pooping or peeing everywhere when the owner goes out for an extended period. It doesn’t start scratching up the place (or digging up the garden) when the owner goes out all day and into the night. I’ve been burnt twice (both ex-tenants claimed the dog damage was fair wear and tear), which is why I now have a ‘No Pets’ rule in my tenancy agreements. I own a dog myself. The large, medium density development I live in allows pets. There are limits on numbers per dwelling etc. Seems to me there’s more analysis required re the costs of building apartments. That average building costs should have gone up from $200,000 to $450,000 (125% increase) in around a year is incredible, and can’t just be glossed over by reference to the small number of builders engaged in that market, surely. Given the huge significance of apartments in addressing our housing problems, this is surely a body blow for densification in the inner city and a huge brake on our ability to house people there. Unless, of course, the data is incorrect. Though retirement village units follow the same trend – as you would expect. Unfortunately the building code makes terrance housing more expensive to build than standalone house. For example the firewall between units are unnecessarily expensive. Also there are more cost regarding councils compliance. All makes terrance house more expensive to build, yet sell less than stand alone house. It discouraged developer to build terrance house. Also the unitary does not have reciprocate policy regarding building a common wall to the next section. Therefore nobody can start build the first terrance house that ajoints an existing house. While a fire rated wall is essential, it’s cheaper than windows / doors that would normally occupy these walls. Yes it does. You can build a party wall and build right to the boundary with the permission of the other owner. Setbacks and height to boundary do not apply “where a party wall exists or is proposed”. So if you have agreement you can build right to the boundary, and once the party wall “exists” the neighbour has the right to build up to it whenever they like. Also for the side and rear boundaries the setback is only 1m and you can go straight up to two stories. So even if you don’t get agreement it’s not especially arduous. A typical suburban section of 6-700m2 could take four terraced houses without infringing anything in the Unitary Plan or needing to go right to the boundary. Nick do you have a reference to this party wall policy? (3) Standard H5.6.5(1) [height in relation to boundary restrictions] above does not apply to site boundaries where there is an existing common wall between two buildings on adjacent sites or where a common wall is proposed. Square brackets are my addition. So all you need is to propose a common wall, which requires only a simply agreement on the title. These sort of party wall agreements are very common in the city centre and old town centres, it basically says both parties agree to the wall, neither party will do anything to affect the other parties use of the wall (i.e. Not damage or demolish the structure and keep it well maintained), and a clause that the agreement remains binding if the property is sold or transferred to new owners. This is routine stuff, just previously you’d need special consent but now the UP lets you do it in most suburban zones by right. Oh and to be clear, the same clause is repeated for the alternative height in relation to boundary and yards section, if you can work out an agreement for a party wall, none of the controls on height to boundary or setback affecting the applicable side or rear boundary apply. Overal height limits, building coverage etc still apply. Great stuff Nick, good work some unknown Council planner, and the Hearings Panel to retain it…. I think one of the big changes that I want done next plan update is removal of Minimum parking requirements (MPR’s) for Mixed Housing Urban/Mixed Housing Suburban (MHS). Building 2 story attached with MPR’s in MHS must be so frustrating. I don’t think it will make a lot of difference. How many people would buy a townhouse without a parking spot? Maybe they would, and assume the council will make sure they can park their car on the street at all times. You can make sure you don’t need a car in daily life if you’re a bit careful, but not needing a car at all would be tricky. I’d say raise the 2 storey limit first. +1, the height limit needs to go in MHS, but I think parking can go in MHU, the locations it’s in are easy to live car free. How many people would buy for themselves, not sure but if people wanted car parks then demand for ones without would drop, then developers would stop building them, you don’t really need a regulation for that purpose. How many people would buy I think plenty save yourself some money, and if renting it out lots of renters would take it up. Also assumes MHS is in transport poor areas, a look at the AUP maps shows not necessarily true. I would say 300 to 400m2 would be a nice size for a standalone house today, especially if you can use 3 levels. I also don’t understand why it costs so much to build a house now $400.000 would be nice to see where that is being spent. I don’t see 400k worth of wood gib roofing etc in the average 200m2 house and I visit bunnings alot and know the prices of just about everything. Shortages of trades, labour costs going through roof. Also most builders work with bespoke designs from client as well as use small use subcontractors which leads to less bulk buying which leads to higher material costs. In lots of countries you have medium-big builders who basically have good deals with certain suppliers because they bulk buy which lowers material costs. Labour cost is the big component as Harriet said. I used to live here, the section sizes are only 110m2 on the smaller properties and that was perfect for my parents and us two kids (we were 18 and 13). The problem for terraces is actually getting driveways/ streets to them, it’s almost impossible to get consent to do a 7m wide street like that so you have to have a body corporate to manage the driveway. One point, terraces can accomodate upstairs/downstairs dwellings fine for 2 brm places. I live in one. In some areas this year will also be the year of the apartment. As Matt foreshadowed last year there are 6 mid rise developments in various stages in Takapuna: Sargeson and 8 Lake Pupuke have commenced construction; Modulus has had some of the site cleared; and Alba, Summer Gardens, and Lakeside are advanced in the sales process. Also to come in Takapuna are at least two terraced projects. With sales in the area at just less than $2M for about 550sq m it seems almost inevitable for most purchasers that the only way will be up. The face of Takapuna is changing rapidly and as Matt suggested public transport options should be changing just as quickly to accommodate this growth. Actually I’d do it the other way around. Keep the laneways. Get rid of the roadway on the other side, as it is made redundant by the laneways. Then you get some actual communal space, the kind which is not reserved for cars only. Those laneways also show you how little width a local street really needs. I hope you are right John that we will see a take off in terraced housing. As for me, I am a bit skeptical on the economics of it. I think we wilk see some, but I think it’s going to be borderline in many places. The govt needs to step in big time to subsidize building affordable mediun density housing. Can’t see the market delivering any 3 bedroom unuts south if 700k. What people have to realise is that NZ’s private sector capacity is far too small and always will be. We need much more intervention to get scale abd slso to avoid the boom/bust nature of the private development sector. I hope you are right John that we will see a take off in terraced housing. As for me, I am a bit skeptical on the economics of it. I think we wilk see some, but I think it’s going to be borderline in many places. The govt needs to step in big time to subsidize building affordable mediun density housing. Can’t see the market delivering any 3 bedroom unuts south if 700k. What people have to realise is that NZ’s private sector capacity is far too small and always will be. We need much more intervention to get scale and also to avoid the boom/bust nature of the private development sector.